Their ties to Concordia run deep. The Wangerin patriarch, Rev. Dr. Norman P. Wangerin, (1924-2009) served for nearly 40 years as a full-time theology and social studies professor, first at Concordia High School and ultimately, when the institution became a university. Before he began teaching, Norman graduated from Concordia in 1943 after six years of high school and junior college. Norman and his wife, Kathryn, (1921-2012) had two sons, Rev. Mark and Paul Wangerin, both of whom also graduated from Concordia. 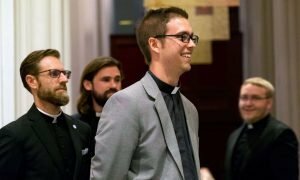 Paul now works as senior research analyst at CUW, while Mark serves as associate pastor at Mount Olive Lutheran Church and School in Milwaukee. Over the span of more than half a century, the four Wangerins have each committed significant gifts that have become a part of the fabric of the university. 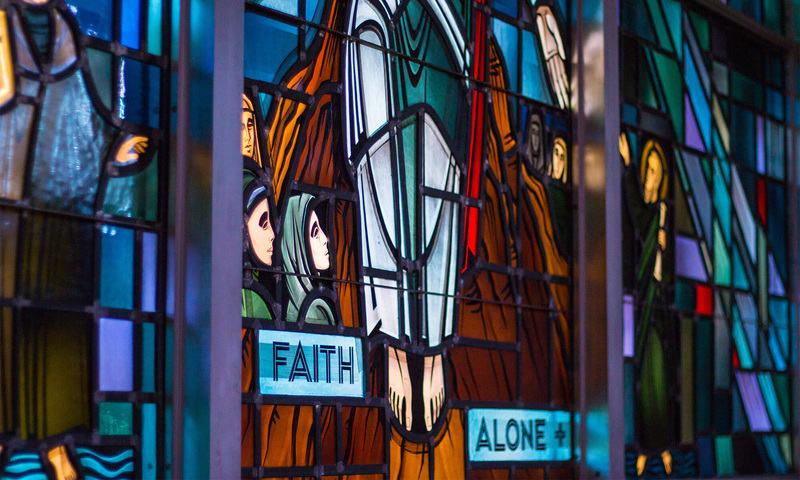 In 1987, Norman and Kathryn contributed significantly to the stained glass window renovation project in the Chapel of Christ Triumphant. 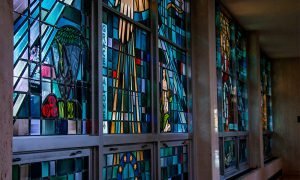 Located in the east transept of the chapel, the windows were dedicated on Oct. 9, 1987 and have been one of the main focal points of the sanctuary ever since. The windows bear the three Latin phrases, Sola Gratia, Sola Fide, and Sola Scriptura, to remind those who gather of the formative principles of the Reformation, which are foundational to the Lutheran faith. 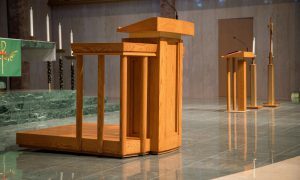 Shortly after Norman’s passing in January 2009, Kathryn, Mark, and Paul donated in his honor the furniture that exists today in the chancel. The donation included the baptismal font, chairs for pastors to occupy during services, the pulpit, and the lectern. 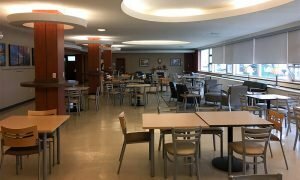 Having formerly been a commuter student at Concordia Milwaukee in the mid-1970s, Paul has donated furniture, artwork, and other updates to the Commuter Lounge. Much of this project was done in honor of Rev. Fred L. Mueller, a longtime friend and former classmate of Paul’s at Concordia who passed away as a result of cancer. Before coming to Mount Olive, Mark served as the senior bibliographer and coordinator of public service at the Concordia Seminary Library in St. Louis. One of the priceless items in the library’s collection is the three-volume Bible and commentary owned by the composer Johann Sebastian Bach. It contains numerous notes, underlinings, and markings, as well as the autograph of J.S. Bach on the title pages. Mark has had the privilege of working with Bach’s original, annotated Bible and was even involved in several publication projects regarding it at the time of the Bach anniversary in 1985. 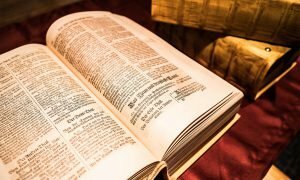 When a unique facsimile edition of Bach’s Bible became available earlier this year, Mark felt compelled to donate a set to The Moeller Rare Books Room in Concordia’s Rincker Memorial Library. “This will be a welcome addition to the library holdings as a research item and an outstanding example of the influence of Scripture in the work of Bach,” said Mark. 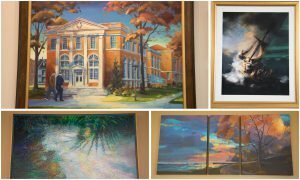 Paul has contributed to the aesthetic of campus by donating multiple pieces of artwork, including four original pieces by one of his favorite artists, Milwaukee-based Hal Koenig. Paul commissioned the Koenig painting that hangs in the library to represent a piece of Concordia’s history, as well as his own. The painting depicts the historic Concordia campus at its location at 32nd and State Streets in Milwaukee, with a view of the front of the campus’ library and Paul as a student and his father walking on the sidewalk in front of it. Another special piece of artwork gifted by Paul hangs outside of Director of Library Services Christian Himsel’s office, on a west wall in the library. Paul donated the reproduction of Rembrandt’s 1633 “Christ in the Storm on the Sea of Galilee” in memory of the late Rev. John W. Saleska not long after Saleska’s September 2017 passing. The family has consistently contributed to multiple endowments over the years and has even started three of them, one in honor of the Rev. Dr. Norman P. Wangerin. The “Religion Endowment” was started on Sept. 4, 1985, and has supported numerous pre-seminary candidates over the years. Paul personally has funded two other endowments, with one specifically designated to help the underserved in the city of Milwaukee. One of the Wangerins’ most recent gifts was a contribution to Concordia’s newest academic building, which is currently under construction. The Robert W. Plaster Free Enterprise Center will house the Batterman School of Business and will provide a setting for CUW to further its status as a leader in the business of health care. The Wangerins’ gift is designated to name a seminar classroom on the second floor of the building. There will be a plaque outside of the room honoring Kathryn, who was one of the first employees of the La-Z-Boy Chair Corporation in Monroe, Michigan.